A bit of a different version of WDYWTSOS, since we all want to see the same thing- Awesomeness and no injuries. What player scores the first points of the game? WVa: Braxton Miller will score first and it will be on a long run. Jason: Rod Smith. My bet is they limit Hyde and with Brax wearing the black shirt his running is cut out. Eric: Might as well ask what your favorite color of M&M is based on the taste. I’ll go with Michael Thomas on a nice Brax pass. 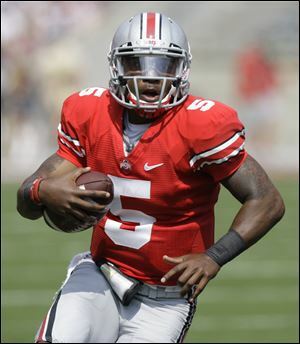 Dexter: I’m going to go with Evan Spencer on a Bomb downfield from Braxton Miller. That is my favorite color M&M. Mali: The obvious answer is Drew Basil. Today’s soundtrack is brought to you by 70 degrees and sunny skies in Los Angeles. Oh, and a little bit of EW&F. In Case You Were Wondering- Here’s the other cover… which may explain why Braxton looks so terrified on his “Breakout” photo. Healing Nicely- At the Combine last week, we learned that John Simon was recovering from shoulder surgery. It sounds as if it was pretty routine, if you call “requiring diamond tipped instruments to cut through his muscle tissue” routine. Nice Gig- Brandon Castel has a great article from the Buckeye Cruise for Cancer (unfortunately named, but it sounds like there are plans to change it). Who do I need to talk to to get assigned to the “Ohio State Cruise” beat? Updates- From Brandon: Jordan Hall is no longer a running back, but will be a “pivot”; Christian Bryant is the emotional leader of the defense (more later); and Urban didn’t really ‘call out’ the other coaches but challenged the conference to raise it’s standards. Gene’s Scene- We’ve talked before about the expansion landscape; Gene Smith this week said that the conferences is not looking to grow until they see how Maryland and Rutgers fit in. So- the B1G is totally annexing the entire B12 on Thursday. So Dreamy- Aaron Craft doing Aaron Craft things, on the radio this time. But… He only gets that interview because he’s a rosy cheeked white guy. After it was unclear if he would return after a brutal collision with Wisconsin running back Montee Ball in the fourth quarter, Ohio State linebacker Ryan Shazier made announced his return in the biggest way possible. With the Buckeyes leading 14-7 and just over three minutes remaining in the game, Wisconsin had the ball 4th-and-1 from the OSU 2-yard line. We all knew who was getting the football, and Shazier knocked the ball out of Montee Ball’s hands and Christian Bryant recovered, giving the Buckeyes possession and the ability to hold on and get a 14-7 victory in Madison. Far from it. The Badgers got the ball back and drove 41 yards in 1:25 and quarterback Curt Phillips found Jacob Pederson for a 5-yard touchdown to tie the game at 14 and send it to overtime. In overtime, the Buckeyes scored first on just four plays as Carlos Hyde carried the ball in from two yards out. Wisconsin’s possession ended on an incomplete pass on fourth down as Christian Bryant broke up a pass, giving the Buckeyes the 21-14 victory. The Buckeyes led the Badgers 14-7 at halftime. After getting down 14-0, Wisconsin was able to respond with an eight play, 82-yard drive to pull within a touchdown heading into the intermission. Statistically, the Badgers somewhat dominated in the first half–and the game. It was no secret Wisconsin wanted to run the ball, and the Badgers totaled 140 yards on the ground in that first half, 206 for the game. Several things stood out from the game, both good and bad. 1. Philly Brown’s growth is somewhat astounding. I wasn’t expecting much of anything from Brown at the beginning of the season, but he’s really blossomed into a nice player. His 68-yard punt return for a touchdown to open the scoring was a thing of beauty. 2. The offensive line’s play is really fun to watch. This has to be the best group that OSU has had in recent memory. Some of it may be that Jim Bollman is no longer the coach, but I really enjoy watching these guys pave the way for Braxton and company. 3. John Simon was named as a Lott semifinalist earlier this week–an award given to the nation’s top defensive player. He played like it today, recording four sacks. 4. Carlos Hyde continues to impress me. He didn’t get the ball nearly enough, but he finished with 87 yards on 15 carries and two touchdowns. 1. The play-calling today was atrocious. No creativity whatsoever and the offensive game plan was extremely predictable. Not very Urban Meyer-like at all. 2. I hit on this earlier, but the run defense was less than stellar today. Ohio State was second in the Big Ten in rushing defense coming into today’s game, but the Buckeyes gave up 206 yards on the ground. Granted, Montee Ball is one of the best backs in the country, but that is just not good enough. 3. Braxton Miller didn’t play his best game today. He was just 10 for 18 passing for 97 yards and was held to just 48 yards on 23 carries. He needs to learn to throw the football away, though. With that said, he’s still one of the top quarterbacks in the country and I’m glad he’s a Buckeye. We all got what we wanted, though. Ohio State is 11-0 heading into “The Game” next Saturday. At times it hasn’t been pretty, but the bottom line is that Ohio State is still unbeaten on the 2012 season–Urban Meyer’s first as head coach. Through just six games, the Buckeyes have had less than impressive victories over Cal and UAB. But they also had a hard-earned victory on the road against Michigan State and had an offensive outburst in a win over Nebraska. There’s no denying Meyer’s impact on the Ohio State offense. The Buckeyes rank second in the Big Tne behind the Cornhuskers in total offense (431.5 ypg) and scoring offense (38.5 ppg). The defense, though? Not so good. OSU ranks sixth in scoring defense at 20.5 points per game and tenth in total defense, giving up 386.5 yards per game. Both numbers will need to improve as the season goes on. But one thing most Buckeye fans will say is that it is exciting to watch Ohio State football again. Through six games, though, there have been ups and downs, surprises and disappointments. With that, I present to you my 2012 midseason awards on both offense and defense. Probably the easiest choice of the group. Ohio State would not be undefeated if it didn’t have Miller. The OSU quarterback has thrown for 1,060 yards, run for 763 and accumulated 17 total touchdowns. Simply put, Miller is everything to the OSU offense. I must admit, I didn’t see much out of Philly Brown in his first two seasons at OSU. But this year, under Meyer, Brown has improved greatly as a legitimate threat at wide receiver for the Buckeyes. Brown has 35 catches so far this season (he had just 14 last year) for 352 yards and one touchdown. Going forward, Brown will be a big part of the offense’s success. There are no stats to back me up here as I’m just going with what my eyes see. But this year’s offensive line is the playing at the highest level we’ve seen in quite some time. With most of the same guys back from last year, and Reid Fragel moving into the starting right tackle spot, the offensive line has been extremely consistent. Have you caught your breath? Did you wake up this morning feeling a little better about yesterday’s Buckeye win? I hope so, because despite a myriad of defensive issues and an offense that at times was stuck in the mud, the boys are 3-0 and looking ahead now to Alabama-Birmingham at The Shoe this Saturday. For as angry as some aspects of the Buckeyes performance made you, you have to admit this one was pretty exciting as a spectator! Ok, we’ll start with the bad since that’s what everyone wanted to focus on during and at the conclusion of yesterday’s 35-28 win over California. I can’t recall an Ohio State defense that tackles this poorly and takes such horrible routes to the ball carrier on the edges. It makes my head hurt seeing guys fly to the ball and put a shoulder on someone and expect them to just go down. Football players are taught at a young age to parallel their shoulders, lift their head up, wrap with their arms and drive with their legs. It really is that simple. See what you’re hitting and wrestle it to the ground. Etienne Sabino, Christian Bryant, CJ Barnett and, unfortunately this week, Ryan Shazier I’m talking to you. And how in the world is it possible that we see these guys chasing running backs from behind just a few yards across the line of scrimmage in the manner that we do? Are they that completely out of position or is it the angle they take to the ball carrier? I have to assume it’s a little bit of both but for the most part it appears to me to be the latter. A lot of people blew up my twitter account during the second half with comments on how badly Luke Fickell was calling the game. I can’t speak to that, and honestly neither can any of the people claiming his defensive calls were wretched. I can tell you undoubtedly that in the first half he did an excellent job of mixing up his blitzes and keeping the Bears guessing where an attack was coming from. I can agree that, yes in fact it appeared as though they went away from that strategy in the second half. However, it doesn’t in any way indicate that Fickell was calling a bad game. His players were in positions to make plays, the problem is that they were either taking terrible angles to the ball, getting caught in the wash or being blocked. If You're Gonna' Go, Go Big. Captain, My Ca… Ah, Screw It- At this point, no captains have been named for this week’s matchup with TTUN. I’m sure it’s Brewster, Simon, and some other folks. Injury Report- Sweat is a “doctor’s decision”, due to it being a head injury. Philly Brown is going to be OK, but safety Christian Bryant is “questionable” for the game. No additional information on Bryant, but he’s currently listed as the starter on this week’s depth chart. It’s still the Ohio State/M*chigan game, still the greatest rivalry in all sports. We wouldn’t attack it any other way. That’s what is remembered. We understand that. We know that. Our guys have understood that regardless of what the situation has been in the last 10 years that I’ve been here or even the five years I was here as a player. When you come here, you know what it’s about. That’s why I’d say 70 percent of our guys are from that 250 mile radius, been grown up, born into it, and know more about what this rivalry is all about than most. Your Michigan counterpart refers to your employer just as “Ohio.” Have you noticed that, first of all? …Coach Bruce or Coach Hayes used to not refer to the team up north or whatever that is, hopefully that it’s no disrespect to Ohio University, they are Ohio, but it is what it is.